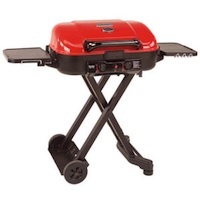 This grill is amazing for people who live in apartments or want to cook by the river its easy to transport easy to clean and definitely gets everyone talking saying " I want one now" great gift idea for dads! I love my grill. I received the grill at as a gift. It's so easy to use and I can bring it anywhere! The grill heats up quickly with the propane and equally grills well. Last Christmas we bought our son the Coleman Tailgate grill. He loves sporting events baseball, football and soccer and attends the professional games as often as he can afford to. They always tailgate and he was thrilled with the product. it is rugged as it has to be shuffled in and out of the car, but light enough to carry and set up. It handled his grilling needs at each game and his friends attended. He now has a tailgate "system" and the grill is at the center of his menu.